Tektite colour (or color if you're not from the commonwealth) is principally controlled by the iron content. The high temperature impact event will reduce most of the oxidised Fe3+ in the sediments to Fe2+. Muong Nong-type impact glasses closer to the impact site, where the temperatures were lower, contain more Fe3+ (Koeberl, 1990). If one views the iron content of tektites a trend can be seen with colour (see Tables below). The iron in tektites is reduced from Fe3+ to Fe2+ by the high temperature impact event. Fe2+ gives rise to a greenish colour, which is typical of tektites - even the browner varieties will have a greenish tinge. If you ever see a greyish tinge then you are looking at obsidian. 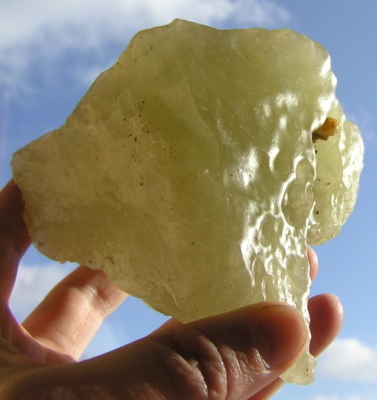 ABOVE: Libyan Desert Glass is usually a yellowish green. ABOVE: Moldavites are usually various shades of green. ABOVE LEFT: Obsidian (note the grey colour). ABOVE RIGHT: An Australasian tektite showing typpical olive brown-green colouration (without even a hint of grey). RIGHT: The silica and iron chemistry of tektites and the relation to tektite colour. Indochinite data from O’Keefe (1963); Georgia tie data from Albin, Norman and Roden (1996); Moldavite data from Engelhardt, Berthold, Wenzel and Dehner (2005); Libyan desert glass averaged from Fudali (1981). All data in wt%. RIGHT: Electron microprobe analyses of three two-coloured moldavites, showing colour against total iron content (from King & Bouška, 1968 and Bouška & Ulrych, 1984). The colour of moldavites is a function of the iron content (and the redox state of the iron) with low iron abundances giving a light green colour and higher abundances of iron giving a darker green to olive colour (Koeberl, 1986, after various Bouška et al. papers). In agreement, Bouška (1994) states that the colour of moldavites is dependent on both the Fe3+:Fe2+ ratio, where an increase in Fe3+ results in a browner colour, and on the total iron content. In moldavites the most important colouring agent is Fe2+ (FeO) where the Fe3+:Fe2+ ratio remains relatively low (Bouška, 1994). Fe2+ is known as a ferrous ion, it is iron in a reduced state and is pale green in colour. Fe3+ is known as a ferric ion, it is iron in an oxidised state and in nature forms dark reddish brown Fe2O3 (Hematite) and, with a mixture of Fe2+ and Fe3+, forms black Fe3O4 (Magnetite). Dilution of the aluminium silicate basic glass matter by alkaline earth's apparently leads to the manifestation of even relatively lower Fe2+ contents in the poisonous green colour. Calcium and magnesium oxides contribute to the brightness of the colour tones of the glass, clarify the glass matter and generally decrease any cloudiness of silicate glasses (Bouška, 1994). The colour of moldavites in the proximal southern Bohemian area, around 300 km from the impact site, are predominantly bottle greens, although all shades exits. The Moravian tektites, still proximal, but around 400 km from the impact, are more typically browns and olive greens, with light and pale greens now absent (Bouška, 1994). Similarly in North American tektites the proximal georgiaites have an olive yellowish-greenish brown colour and, when thin, are translucent. The medial bediasites are darker in colour and more of an olive brown. Insufficient data exists on colour variation in the Australasian strewn field. The author has heard of olive green Australasian indochinites and philippinites, but never observed them, leading to questions whether they actually exist or the colouration is exaggerated. There appears to be less colour variation in Australasian tektites and this may relate to a higher iron content of the parent sediment. With reference to a major element table in Koeberl (1988) it appears that the more proximal tektites contain a lower iron content. Koeberl et al. (1984) showed that Muong Nong-type impact glasses generally have a lower FeO/Fe2O3 ratio than splash-forms. This probably relates to a lower formation temperature, but could also relate to formation at lower atmospheric (more oxidising) atmospheric levels. FeO percentages were measured at 1.08-2.93% for Bohemian (more proximal) tektites and 1.72-3.50% for Moravian (slightly more distal compared with Bohemian tektites). For proximal georgiaites the FeO content was measured at 1.83-3.14% and for medial bediasites 2.29-5.75% FeO was recorded. This would suggest that the increase in iron content with distance may be linked to the increasingly brown colour with distance. The reason for the variation in iron content is not established. A wide range of colours can be produced in man-made glasses by the addition of perhaps 1 to 3 percent colouring compound. A range of colours can be seen in table below. Most these compounds would never be found in high abundances naturally, and hence no bright red or blue tektites. They do, however, demonstrate that in tektites, whilst Fe2+ generates a green colour and the presence of increasing Fe3+ generates a increasingly brown colour, the play between various chemical components is complex. Some compounds decolorize, others enhance colour, others may darken or subtly adjust the colour. The precise colour of the tektite will reflect the total chemical composition of the tektite. Collecting man-made glass is very rewarding. I have found some amazing glassware at thrift stores including three neodynium / alexandrite glass vases that vary between blue and purple depending on lighting conditions. It's amazing what you can find when you know what you're looking for! ABOVE: The effect of colouring agents on man-made glass. Various online sources. There are a number of methods that can be used to determine the refractive index of glass. A simple method, although not the most accurate, is the immersion method. The glass is cleaned and then crushed to a fine splinters, which are placed on a microscope slide. One then has a set of refractive index liquids, ranging from a higher to a lower refractive index. A liquid of known refractive index is placed on the specimen. Under the microscope a halo (Becke line) is seen. By focusing in and out and observing how this line moves one can tell if the glass is of higher or lower refractive index than the liquid. Another liquid is used and so on until an upper and lower limit is established. If the liquid is the same refractive index as the glass, the glass (if transparent) will appear invisible (Scientific Working group for Materials Analysis, 2004). The refractive index of tektite glass is within the range of man-made glasses. Australasian tektites vary from 1.487 to 1.542, with 1.490 to 1.520 being quite typical (Taylor and Epstein, 1969; Scheiber, 1970, and Glass and Koeberl, 1989). Wondraczek et al. (2003) found the refractive index of indochinites to range between 1.505 and 1.515. By comparison, Moldavites were found to range between 1.488 and 1.495 by Taylor and Epstein (1969) and between 1.492 and 1.505 by Wondraczek et al. (2003). Man-made glasses easily cover the entire tektite range, but bottle glass and window glass are typically 1.510 to 1.520 (Saferstein, 1982). Terrestrial volcanic obsidian reportedly has a range of 1.45 to 1.55, although Wondraczek et al. (2003) typically found obsidians to be around 1.49. The refractive index of the tektite is a reflection of the chemistry of the tektite. It was established early on that there was a linear relationship between SiO2 content and refractive index (Taylor and Epstein, 1969). The higher the silica content, the lower the refractive index. According to Wondraczek et al. (2003) higher amounts of Fe2+ and Na+ ions, instead of K+ and alkaline earth ions, raises the refractive index. Wondraczek et al. (2003) also suggests that the thermal history of the glass influences the refractive index, with longer cooling times resulting in a lower refractive index. Wondraczek et al. (2003) after Scholze (1968), also demonstrated that the refractive index of obsidian decreases with increasing water content. The principal value of refractive indices, which are a reflection of the chemistry of a specimen, is to group specimens. Variations within a strewn field can be identified. Geographic patterns of these variabilities can then be plotted. By the same reasoning, true tektites can be differentiated, to some extent, from man-made glasses or other natural glasses, although over-lap does exist. Related to refractive index is the Abbe number. This is a measure of the material's dispersion in relation to the refractive index. Dispersion is the variation of refractive index with wavelength. Colours of shorter wavelengths (violets, blues) travel slower than colours with longer wavelengths (reds, yellows). Higher Abbe numbers disperse light less. The higher the refractive index, the lower the Abbe number (Fesmire, 2008). As with refractive index, the Abbe Number is of value in classifying and grouping natural and man-made glasses. Some tektites are said to exhibit iridescence, which comes in the form of 'oily' rainbow-like reflection of the light. I have to say I am not wholly convinced and would normally attribute such shows to oil contamination on a mine or construction site. Maybe it does truly exist though as iridescence is noted on some weathered man-made glasses and has also been recorded in volcanic obsidian. The colour display is reportedly due to the refraction of light by thin layers of weathered glass. According to the Ancient Glass Blog of The Allaire Collection (2014) 'the word iridescence comes from Iris, the Greek Goddess of rainbows and refers to rainbow-like colors seen on the glass which changes in different lighting. It is simply caused by alkali (soluble salt) being leached from the glass by slightly acidic water and then forming fine layers that eventually separate slightly or flake off causing a prism effect on light bouncing off and passing through the surface which reflects light differently, resulting in an iridescent appearance'.